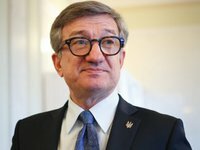 Independent MP Serhiy Taruta has said that the site for talks on peaceful settlement of the conflict in Donbas should be transferred from Minsk (Belarus) to Vienna (Austria). "I propose to move the site from Minsk to Vienna, because everyone is tired of Minsk. No one has any hope that the issue will be resolved there," he said at the Ukrainian Congress of Leaders of Non-Governmental Organizations "Donbas: Road Map 2018. Joint Vector" in Kyiv on Saturday. The lawmaker said that Austria, unlike Belarus, is a neutral country, where the OSCE headquarters is located. "I propose to negotiate with Germany and France that special representatives should also be appointed, as it is in America. There should be special representatives from Germany, France and then from Ukraine, who would conduct negotiations on a constant basis," Taruta said. He said that diplomatic negotiations on the conflict in the Donbas are held too rarely.